This morning, while enjoying a cup of coffee with Sani, I noticed a praying mantis “baby” (what’s the correct word in English?) on the back rest of one of our garden chairs. 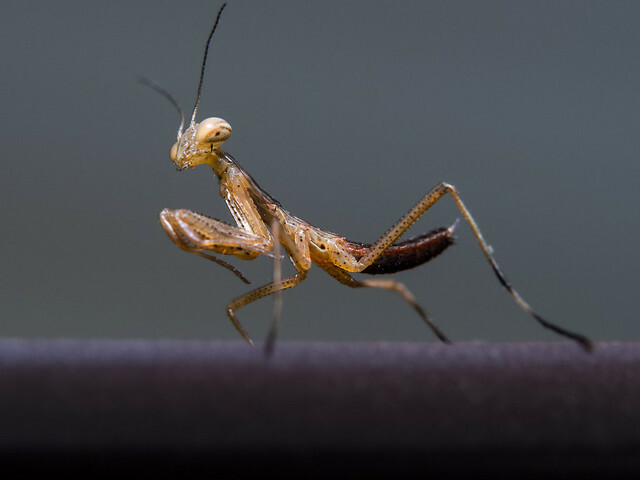 I was deeply intrigued since I had never seen a mantis this young and small before. I had to take a picture right away! 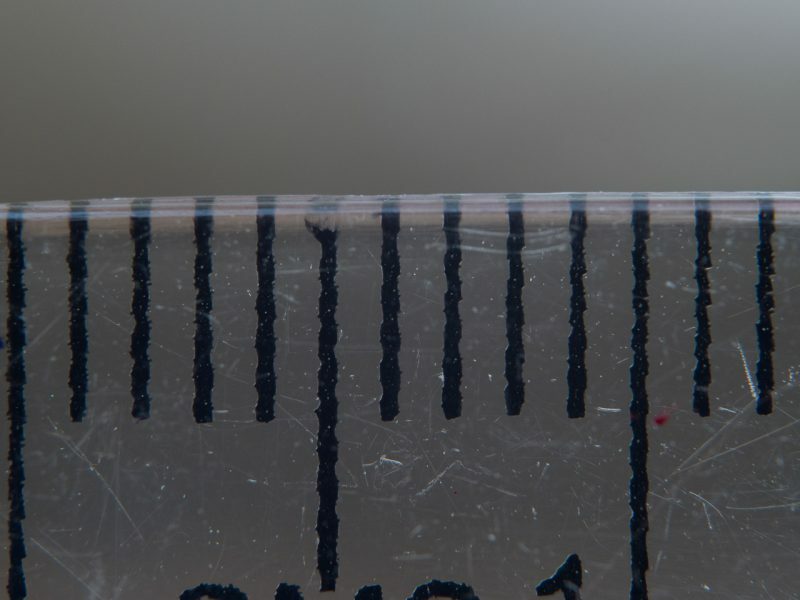 It being only 7mm or 0.276” in size – as I later found out by taking a shot of a ruler (see below) – I had to make use of every magnification boosting piece of gear I have. I screwed my FOTGA automatic extension tubes (both 10mm and 16mm) onto the OM-D E-M10, the Olympus 45mm f/1.8 onto the tubes and attached both of my achromatic lenses, Marumi DHG200 +5 and Raynox DCR-250, onto the lens. I didn’t know what to expect, since I had never used all of this gear together before. Using two achromatic lenses or one achromatic lens and the tubes is already pushing the Oly 45/1.8 almost to its limit. I first took half a dozen photos handheld, while kneeling next to the chair. Not a single one was in focus. At this magnification, even at f/8 depth of field turned out to be so thin, that even my heartbeat was enough to move the camera out of focus. I pulled up another chair next to the one the mantis was on, set down and placed my elbows on my thighs. 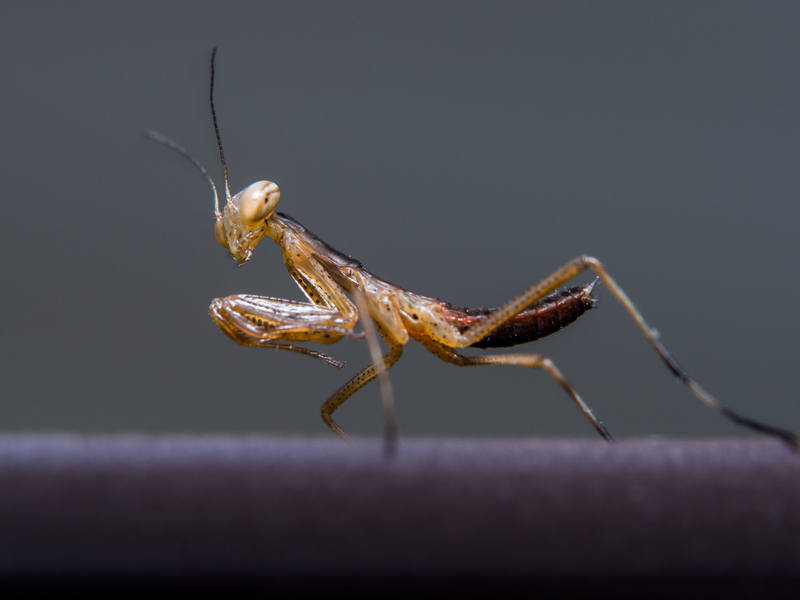 By then the baby mantis had moved on and was on the side of one of the slats of the back rest. It was too low, at the same level as my stomach, preventing me from using the EVF. Again I took half a dozen shots while stabilizing the camera only with my hands and composing with the LCD screen. No success. What happened next was a wild chase around the individual slats of the back rest, until the mantis stopped and started to clean its antennae with its mouth. This gave me enough time to set up the shot properly. I was able to use the EVF this time around, which resulted in several sharp shots. Still, the mantis was in an awkward position, with the table with black legs behind it. In combination with flashlight this made the background entirely black. What I wanted to do, instead, was to balance flashlight and ambient light, for a more natural look. I had to persuade the mantis, by tapping softly with my finger next to it, to move in the direction of the top of the back rest. The background was much brighter there and it was easier for me to lean my elbows against the chair and stabilize the camera even further by using the EVF. In addition I stopped down to f/11, even though this is well inside diffraction territory. What resulted was another dozen or so images, two of which were keepers. The following shot was the second keeper, but I decided to upload the shot at the beginning of the post to Flickr because of the “heroic” posture of the mantis – even though one of its antennae is very close to the border. As for the 1.33:1 magnification ratio, here is the aforementioned shot of the ruler. If you have any questions or suggestions, don’t be shy. Amazing shot and amazing what we are willing to do to try to get good shots. Helps lots to have good equipment and patience too. That is pretty cool Ivan. Very well done! Interesting read. I have the 45mm f1.8 and Raynox 250. What extra advantage would the Fotga tubes give me in addition to what I’m already using? Slightly more magnification? Thanks. I haven’t compared the FOTGA tubes to my Marumi or Raynox, but going by my gut feeling I’d say that it would give you and advantage similar to an additional Raynox 250. Thanks Ivan. Interesting. I may pick them up as they’re fairly cheap at £20. You are welcome. They cost me around 22 euros in Austria. Extension tubes are cheaper than achromatic lenses, but they cost you a bit of light.